The student fee-funded phone app is renewed – but will students use it? On Feb. 19, the leaders of UH Hilo’s Chartered Student Organizations (CSOs), campus organizations funded by student fees, received an email with the header “UH Hilo App-Renewal (URGENT)” from Campus Center Interim Director Lai Sha Bugado. In the email, Bugado urged the CSOs to decide whether they can each apply $3,750 from their respective budgets to pay for the renewal cost of $15,000 for the UH Hilo app. The CSOs that would make the decision are the Board of Student Publications (BOSP), Board of Media Broadcasting (BOMB), the Student Activities Council (SAC), and the UH Hilo Student Association (UHHSA). Though Bugado’s email initially requested to have a decision reached by Feb. 21, only two days after the email was sent, the CSOs got an extension to the end of the month. By Feb. 28, every CSO had approved allocating their budgets. The last minute nature of the renewal came as a result in changes in staffing the Campus Center underwent recently, including her taking up the role of director. Among these changes, Campus Center lost track of the time that the app was to be renewed. BOSP president Gabby Iniguez-Isaacs commented, “We have no problem funding this app; the question is: how will we make improvements to keep students engaged on the app after they first download it?” Iniguez-Isaacs was referring to the steep user decline the app has historically faced after students first download it. The issue, students told Ke Kalahea, seems to stem from many feeling that the app’s uses don’t carry over past introductory features. “I liked using it to find my classes at first, but after that, I never used it,” said one student in an informal poll. There is one area where the app’s user activity seems to be very active: the buy and sell feature. Using the student’s wall, students advertise everything from mini fridges, to used bikinis, to electronic cigarette pods. One user even regularly advertises their haircutting service. Ke Kalahea sat down with Lai Sha Bugado, a big proponent of renewing the app, to learn more. She told us that the app was a student initiative that started in 2015 with the goal of providing students a way to conveniently access campus resources. The original company that made the app was called Oolala (stylized as OOLALA), a Canadian app developer that makes apps catered to student life on campuses. In 2018, Oolala merged with DubLabs, a company that specializes in app development involving academic resources. Combined, the companies formed Ready Education, which has been handling the app since. When UH Hilo’s CSOs first purchased the UH Hilo App, the fixed yearly renewal rate was $7,500. When they renewed last year in February 2018, the price doubled to $15,000 in order to allow access to analytic services to the administrators, such as the CSOs, and higher-up faculty such as Bugado herself. The analytics feature allows them to track student usage of the app, including information such as the weekly, monthly, and semesterly number of unique users. Bugado was also excited about the introduction of an in-app QR code reader, allowing students to instantly register at events and for student organizations hosting the events to have consolidated data about turnout rates. In doing so, Bugado says that students can be better served by the CSOs that students are paying their fees to. Since CSOs are funded by student dollars, turnout to events and engagement in funded projects are often an indicator of the success to CSOs. 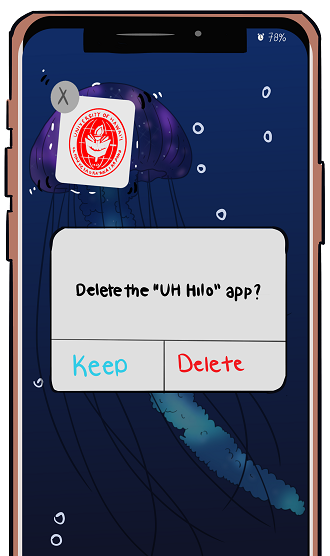 “By allowing the app to continue for another year, we hope to get more buy-in from the academic side of [UH Hilo], so that they can spread its popularity, as well,” said Bugado. In the coming weeks, she hopes to train various campus organizations on the ways the app can be utilized and to be able to better understand the features that benefit them, and, hopefully, the students ultimately funding them and the app.